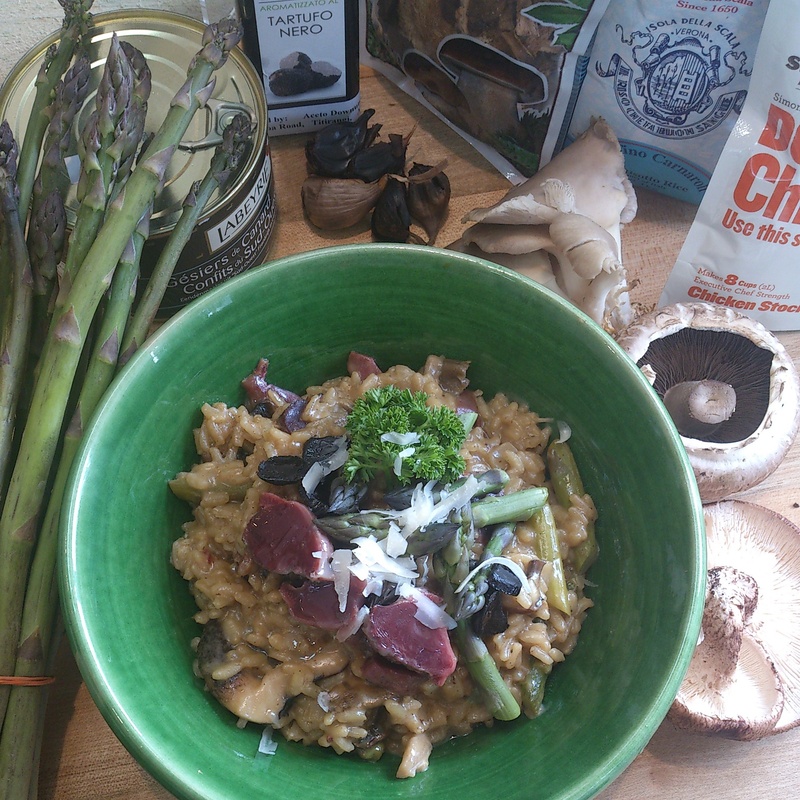 Spring has officially began, but we still need to warm up and what is better that a creamy risotto with porcini mushrooms and seasonal asparagus? If you are vegetarian, just leave out the gizzards. The shopping list from La Cigale French Market stallholders is below. You can add more mushrooms and/or another variety (porcini are so tasty), but do not skip the cream & parmesan cheese! Heat the butter in your cazuela (Spanish terracotta dish keeping the moisture) or pot on the stove top. Add the chopped onionsand cook till soft but not brown, add the sliced mushrooms and cook for another 1-2 minutes. Add the rice and cook until translucent (about 2 minutes). Then, pour in the white wine and let evaporate. Add the hot chicken stock ladle by ladle (wait until the liquid boils off between each ladle). During that time, brown the porcini mushrooms and the blanched asparagus in a little of the duck fat (from the gizzards tin). When cooked, add the chopped gizzards and black garlic, gently stir together. Once the last ladle of stock is poured and evaporated, add the mushrooms, asparagus and gizzards and mix together. Add the shaved parmesan cheese (quantity depends on your taste), a few drops of truffle oil and the crème fraiche, pepper if necessary. Mix again and serve quickly. Decorate with some parmesan cheese shavings and finely chopped parsley.